Over the past few months we’ve been working very closely with the Sucuri Security team who we commissioned to do a full audit of our core products’ codebase. 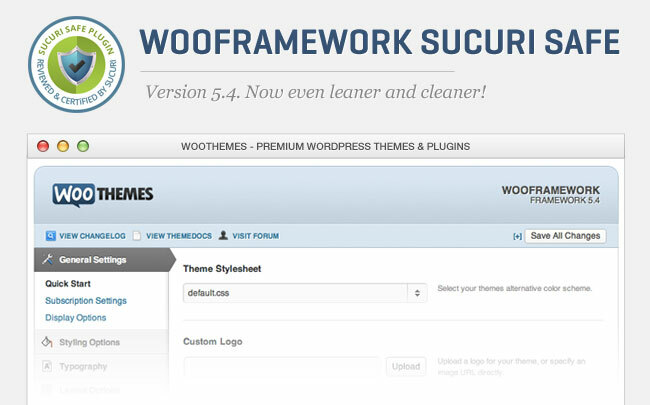 We’ve already released WooSlider and WooDojo with Sucuri Security’s stamp of approval, and today we are happy to announce that the WooFramework – the engine that powers each and every one of our WordPress themes -is now also Sucuri safe. Version 5.4.2 of the WooFramework is now available for download through the “Update Framework” link in your WordPress admin area. This update fixes bugs mentioned in customer feedback since the release of version 5.4.0. If you note bugs after upgrading to WooFramework version 5.4.2, please post them in a ticket directly to our support desk.